Please Bring Epic Grey Shirt/ Shorts/ Water and Ball to all practices and games! Please Bring Water- Grey Shirt , Socks , Chin guards, cleats and soccer ball. Epic Soccer Club was established for the specific purpose of developing a highly competitive youth soccer program in the Phoenix & surrounding area. One of the club’s main goals is to provide soccer programs and opportunities for players and staff at a local, regional, and national level. The club is committed to developing players to their maximum potential and to help prepare and educate them for the possibility of receiving college scholarships based on their playing ability and academic achievements. Technical: A player’s individual technique on the ball and how it is applied to the demands of the game will be our focus. Tactical: Each player will be evaluated on how they carry out their individual and team tactics during the course of the game. More specifically how they adapt and adjust to the demands of the game. Physical: Each player will be evaluated by their speed/agility, strength/power, recovery and overall game fitness. Psychological: Each player will be observed on their soccer attitude on and off the field, i.e., preparation, motivation, emotions, willingness to play and try different positions. Epic Soccer Club is committed to teaching fundamental skills, instilling confidence and building a love for the game of soccer in youth players while continuing to develop those players to their highest potential through excellent qualified coaching and superior training in a positive environment. Create an environment where players are developed to their fullest potential and have the best chance of self-actualizing as citizens, students and athletes. Provide professional leadership, high quality coaching and instruction with an emphasis on life skills, game play fundamentals, strategy, clean living, good health and having fun! 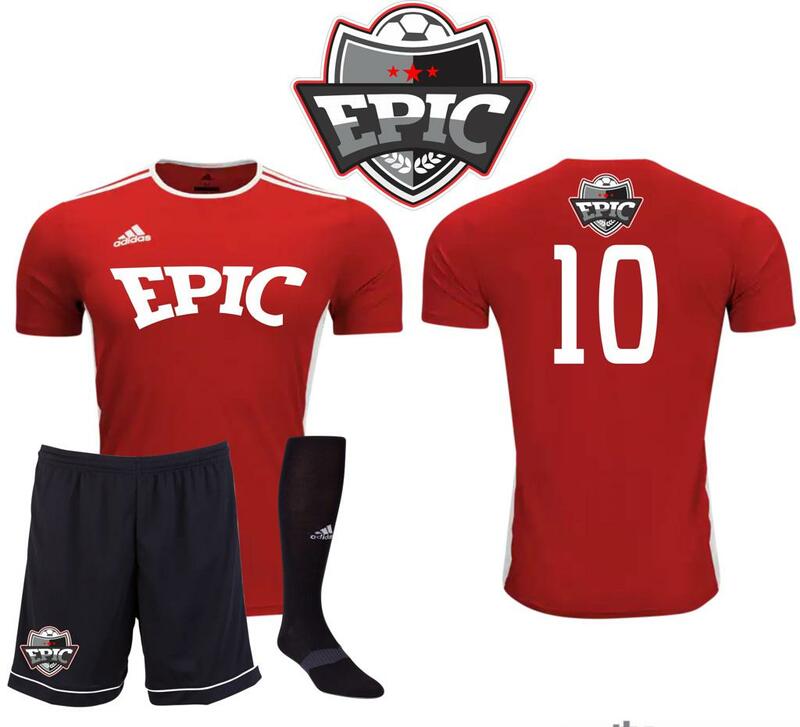 Epic Soccer Club strives to field the best possible teams and consistently produces the highest level of competitive players – admired for their skills and respected for their sportsmanship. Adidas Backpack, Epic Warm ups, Fan Gear, ETC. EPIC SOCCER CLUB "CLUB PRACTICES"
©2019 Epic Soccer Club / SportsEngine. All Rights Reserved.